Wait a few minutes allowing the water to drain from the leaves. Now squeeze out very well the remaining liquid with your hands. You can now roughly chop the boiled spinach leaves. Now combine all the filling ingredients together and adjusting the seasoning to your liking. I use roughly one teaspoon of the filling for my ravioli (as seen in the picture). I would recommend to try and make one or two pasta parcels first. The quantity of the filling will depend on the size of the ravioli you want to achieve. You can use stamps like mine that help to extract the unwanted air and seal the edges without the need to use an egg wash* (to glue the pasta sheets together). If you don’t have that kind of stamp or a similar one (with the open top) you can use metal rings/ moulds or even a water glass. Alternatively cut the pasta into squares and seal the edges with a fork or using your hands. Use the size of a teaspoon as guidance. 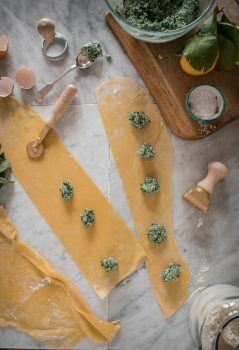 If you are not using a stamp and want to make sure that the pasta sheets will stick together, beat one egg and brush it around each mound of the filling. Cut out another rectangular pasta sheet of the same size and gently cover the previous one pressing on top and around the filling mounds making sure that there is no air left in your parcel that you are making. Now take the stamp of your choice and cut out the ravioli. Bring a large pot of water to boil. Add a generous teaspoon of salt. Drop the prepared ravioli into the pan, stir gently and cook (without the lid) for about 1-2 minutes until they come to the surface. You can check one of your ravioli if the pasta is cooked enough, if not keep them in the water for another minute or so, otherwise remove them from the pot with a slotted spoon and add them to the pan with the warmed up tomato sauce, which you have prepared a few moments earlier (see the method below). Give it a gentle stir, sprinkle with the grated parmesan and decorate with some basil leaves. Heat up a couple of tablespoons of olive oil in a pan. Add the peeled and gently crashed garlic cloves and colour them on both sides (making sure they are not burned). Now pour in the passata, turn down the heat and simmer without a lid for about 15 minutes. Add a pinch of sugar and some salt to taste. Tear in your hands a handful of basil leaves, add them to the sauce and cook all together for about 5 minutes or so until the sauce absorbs the basil aroma.